Business letters are typically used for procuring new business opportunities and promotional activities. They are utilized for explaining any products that are newly launched to the concerned organizations to seek business from them. One can make use of these business letters to explain the company’s various Closing Business Letter activities and product or project achievements to the concerned persons or organizations and clinch the deal. They are also used for securing joint venture business by explaining about the proposed project in-depth and various advantages of executing it. Some of the business letters are used by the aspirants to present their applications for the business related vacancies that exist in an organization. 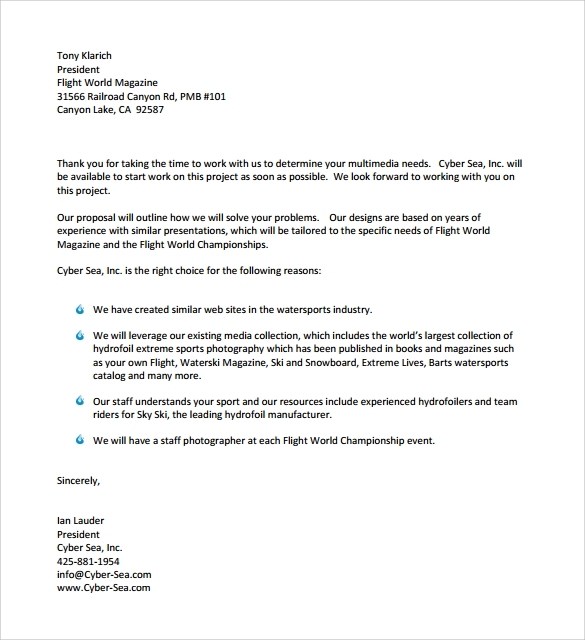 This business letter format example written by an executive of the business organization to a prospect seeking feedback from him about the organization and expecting a business proposal from him based on the marketing CDs that were sent to him. The prospect met the executive earlier in a promotional stall. 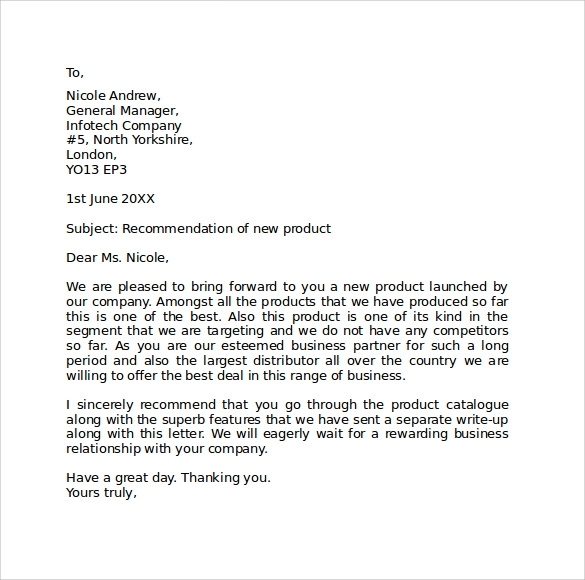 This sample standard business letter format in word document explains to the manager of an information technology organization about the launching of new product and seeks business relationship. The letter says that the new product is unique and has no competitors. It requests the manager to go through the catalogue and the features of the product. 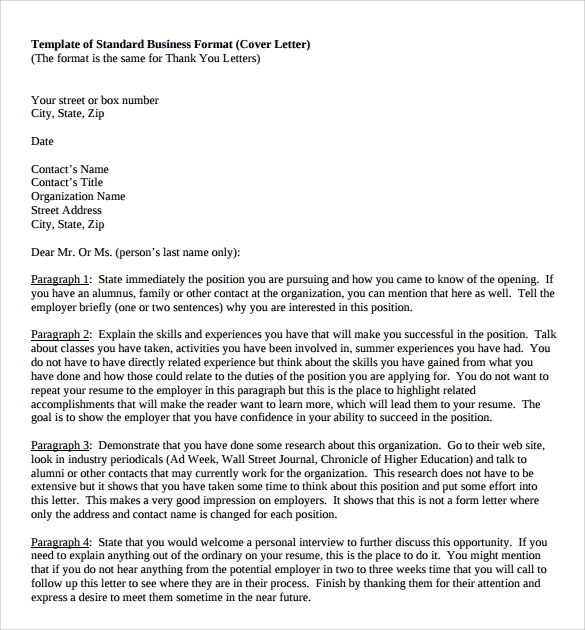 This sample standard business proposal letter format is about an applicant’s application for the vacancy of sales manager for a service organization. The applicant explains in-depth about his experience and expertise that he achieved from working in various organizations. The applicant also explains the objective of the applicant and expects to get response from the organization. 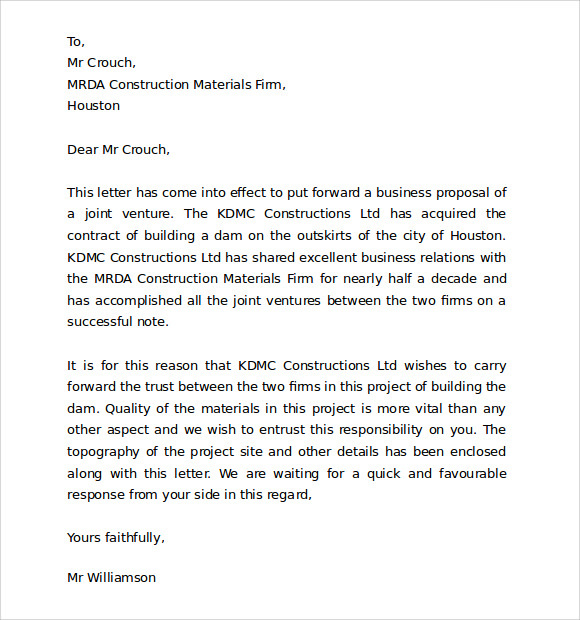 This business letter is written by a construction company about seeking business joint venture proposal for the project of construction of a dam with another prominent construction. The letter explains the recent acquisitions it had made and explains its various achievements in the construction sector and encloses the dam project details as well. 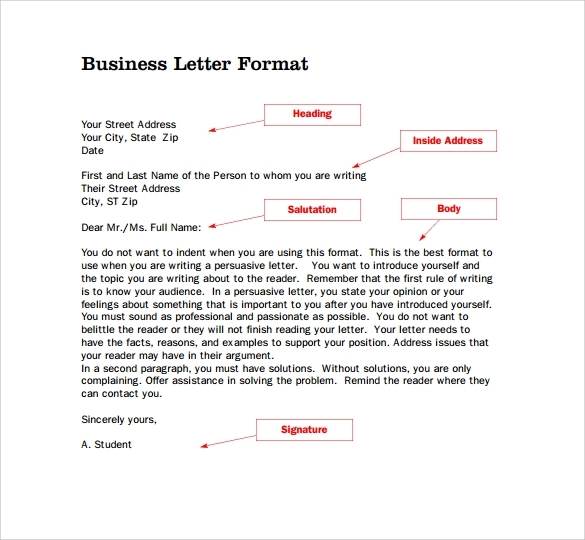 These business letters formats help to write excellent business proposals either to close new business deals or to explain the Personal Business Letter methodologies to the prospects for securing business proposals. They help to make the top brass of the company to understand the various projects that are executed and explain the benefits of the new projects to secure joint venture deal. They help to send catalogs, compact disks and other important and detailed information about a product or project to the organizations which help them to review carefully and give go ahead. For job seekers these sample letters help to write a perfect application to secure a suitable position. During business interaction with prospects either at conferences or at promotional stalls sometimes it may not be possible to explain the details about the company and its business activities. In order to keep in touch with them and to get a good deal these business letters can be easily utilized by making simple changes. 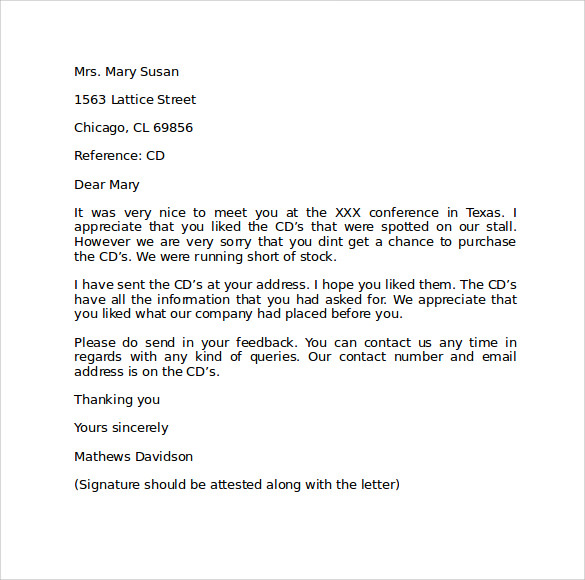 To communicate various organizations about a new concept in product that has no competitors, through these business letters one can explain and can send the demo CDs. 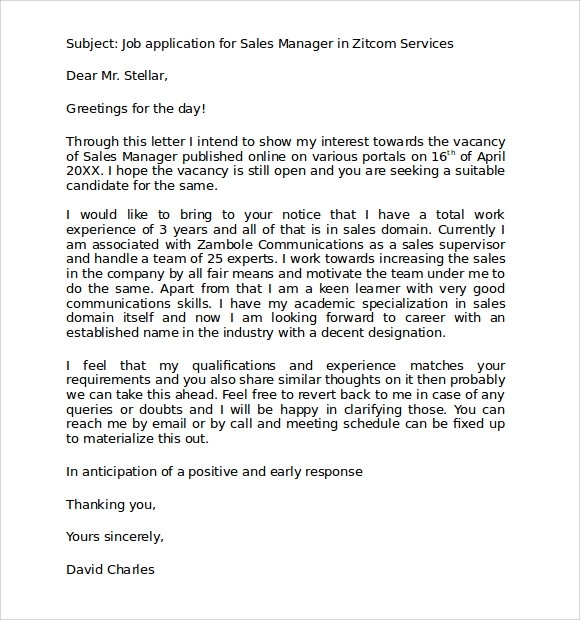 Experienced sales managers who have good exposure and expertise can make use of these sample business letters and apply to the positions in reputed concerns to fetch a job. These standard business letters are ready to use formats for all their business proposals and business promotional purposes. One need not spend any price to get the Business Letter Format written and these samples and formats can be perfectly utilized by just downloading them. One can make appropriate changes and use them instantly. They come with ideal letter fonts and font sizes and they are aligned properly. They come with predefined universal business letter format and one can rest assured about their perfection with regard to letter format. 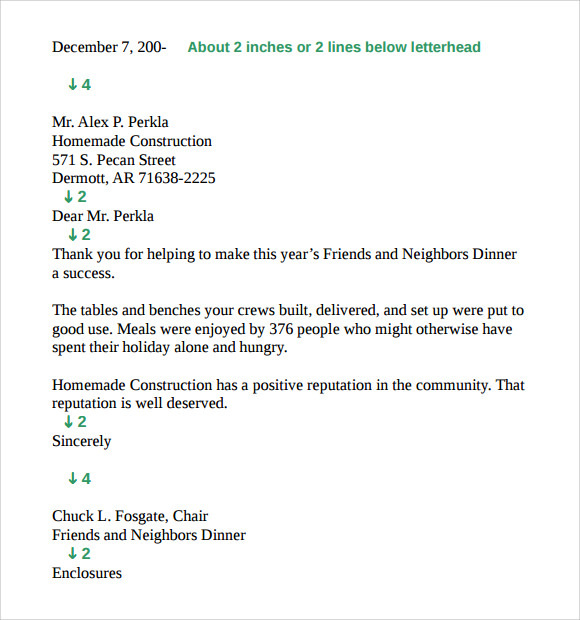 They also come with samples to show appreciation about services performed by construction organization. The above samples and formats of some of the standard business letters should help one to gain knowledge about how to address the needs of business promotional activities with perfection. They are perfectly designed and they are free to download. One can make great use of them by making least changes.